This is Part II of a two-part article dealing with managing and implementing change. Part I examined methods of leading personal change among employees. Part II examines Organizational Change. As was examined in Part 1 of this series, change affects employees on a personal level and effective leaders realize and proactively plan for these impacts. However, effective leaders also realize the impact of change at the macro or organizational level. With the fast-moving and demanding environment that organizations face, mastering and accelerating rapid change is becoming increasingly more complex and important. Whether mergers and acquisitions, restructuring, new management team, or new technologies, organizations and leaders who challenge and direct change will be the survivors of the 21st Century. Leadership Readiness: Do you have the right people, with the right skills, in the right positions to meet the demand of change? Vision Clarity: Is there a clear vision and mission at the right level of detail? Have core competencies, goals and objectives been developed at the right level of detail? Assessment Accuracy: Has there be a proactive assessment of how the change will affect Change Impact Areas such as organizational culture, organizational structure, job roles/responsibilities, skill/knowledge requirements, worker motivation/incentives, communications, operating policies/procedures, processes, employees? Change Marketing: Have the benefits of the change been identified? Has the need for the change been communicated before the solution? Is it at the right level of detail for all stakeholders to understand? Stakeholder Participation: Have the stakeholders – both formal and informal influencers – been identified? Has there been the right level of involvement by the right level of personnel participated in the decision-making? Do people “perceive” they have been consulted? Communication Planning: Is there a formal communication plan? Is accurate information being passed through the organization? Is two-way communication available and encouraged? Training Assessment: In a new environment what new skills are needed? Is there a formal way to assess new areas for training/education? Change Integration: Are you coordinating multiple activities across departments, groups, regions and countries? Is there a deployment plan that overlaps activities, milestones, and dates? Is someone actively serving in an integration role? Transition Timing: Is there an implementation plan that says what will change now and what will change over time? How ready is the organization for change? Does the culture invite change and work well within it? 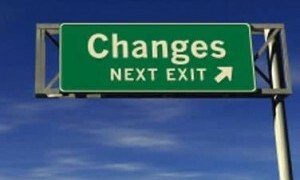 Think of a major change that your organization is facing or has recently completed. It could be restructuring, downsizing, new product implementation or a new technology. If you were to give a letter grade (A-F) to your organization on these change essentials how would your organization do? How well would you do? A few years ago a printing/publishing client was facing major change in their industry. The Chicago-based company included two major divisions – one published small suburban newspapers- the other division was a commercial printing operation. With the spread of around-the-clock television news and yuppies in neighborhoods getting news from the internet, the industry faced a major trial. In order to address their future mission they used the Nine Change Essentials as a guideline for a meeting with their executive committee and the board of directors. When addressing the visioning and leadership elements, the board chairman realized that the president of the newspaper publishing division had plans to buy other newspapers and take on the media competition head-on. The president of the commercial printing division had plans to sell the publishing division and already had some bids! Both division presidents sat in offices adjacent to each other – but neither knew about the others future plans (nor did the board). Needless to say by addressing the vision/mission element first, each meeting participant was able to use the other elements to move the organization into new directions. The facilitation using the Nine Change Essentials was instrumental in redirecting the corporation into several major new initiatives. I have used these nine principles in management meetings for multiple clients – from a merger of a large Fortune 50 company to smaller entrepreneurships. Usually these elements are used in a group session with each participant giving the elements a letter grade. As each element is discussed an action plan is developed to proactively address the top change essentials. Each time a leader/manager examines these concepts it forces them to realize the impact of change and to identify interventions to address the change. As a leader what grade would you or your organization receive on the Nine Change Essentials? [iii] Model developed in conjunction with Robert Hunter PhD, the author, and Arthur Andersen colleagues (1989).